An unforgettable first Yes live experience. **NOTE TO FY SITE MANAGERS** this is a continuation of the earlier version of the review I did years ago (also listed on this page). It seems to have gotten truncated. Hershey Arena is an intriguing place to see a show. It is a smaller version of a hockey arena & the lack of large glitzy booths selling t-shirts, beer, and food makes for a somewhat more intimate scene. Upon entering, I felt a tremendously mellow atmosphere. There were a few tables on the floor near the mixing console where t-shirts were being sold and there was a Greenpeace table where people could stop by and sign petitions. A large Greenpeace banner had been secured to the right of the stage as well, but the rest of the arena was free of advertisements, banners, and the like. For quite a bit we were all kept waiting while some of the roadies did lighting repairs above the stage. There was no great screaming throng, just this subdued anticipation. Popeye cartoons were shown in place of any sort of warmup band while the crew worked on the lights, which seemed to add to the mellow feeling of the evening. It was as if we all knew there would be a show, as soon as the lights were up, these few cartoons were shown, and the band assembled. The only surprise I had was at the stage. Having grown up with Yessongs and Yesshows, I expected a stage strewn with a panoply of instruments: mandolins, acoustic guitars, spare basses, and an array of keyboards. I was a bit surprised by the streamlined & futuristic slanted stage with its single keyboard rack & drum kit only. At somewhwere around 9 or 9:30 the lights dimmed and the "Rhythm of Love" intro tape started. The band walked onto the stage waving to the crowd in the near darkness, then lit into the song midstream. It was a heavier sound than I had known, but there was no mistaking the stage presence. 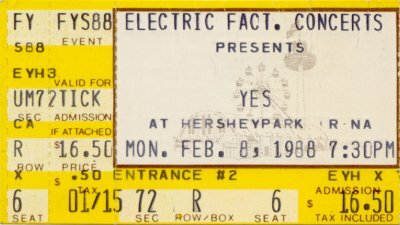 After "Rhythm," Jon ensured that it was Hershey & that they were in the right place, then introduced Alan, who did a short solo accompanied by a bit of a lightshow that struck me as more heavy metal than Yes, and they then kicked into "Hold On." I had a moment of worry where I wondered if the scaled down stage meant that they were going to eschew the classic songs, but as soon as "Hold On" ended my fears were allayed. Jon said, referring to the "Hold On" sunshine lyric, "Without the sunshine we cannot see; without the sunrise we cannot dream. We cannot dream..." With that the band launched into "Heart of the Sunrise" with such power and tight precision that I was riveted. Jon left the stage for the instrumental intro, then returned and sang the rest of the song in a white light that lent him the aura of an angel. The band was really tight on the intricate parts & delicate on the lighter moments, with the lights enhancing all the respective movements of the song. It was astounding to see this complex song sound so good in an arena, and great to see Jon on tambourine. I was hooked.